IT services and solutions "Built Around You." Sayers is an IT services and solution provider offering the latest and most sophisticated technologies. We partner with world-class vendors. Our videos and webcasts introduce best practices for your cloud computing, data center, security and mobility, and networking initiatives. See more at www.sayers.com. Reduce your response time by 90% with Co3 Systems. This 30-minute webinar will discuss how the Sayers Cloud can be an off-premise extension of your existing IT infrastructure. 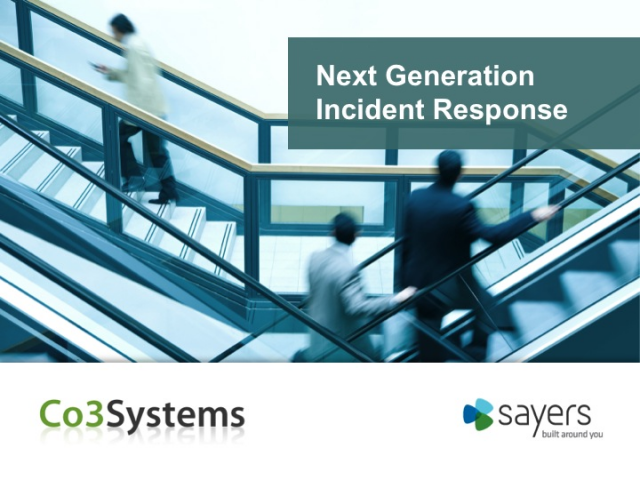 Now in its second year, Sayers Cloud has proven success in helping our customers scale IT services flexibly and cost-effectively, whether for production compute, test/dev or disaster recovery needs. Learn how the Sayers Cloud is a cost-effective and efficient way of enabling your Business Continuity plan. - What would availability mean for your business? - How can you grow your revenue with better, more efficient infrastructure? The Sayers Cloud is "Built Around You," allowing you to extend your current network infrastructure and bring your own security into your cloud environment. Gain insight into your environment using VMware vSphere with Operations Manager. Our patented analytics tool will help you analyze your environment for performance and configuration issues. Troubleshoot issues quicker, and find wasted resources in your environment. Unisys Stealth for Mobile extends your data center security to mobile devices, leveraging application wrapping software that encrypts data-in-motion from the mobile app across the internet, rendering your data safe from hackers. Chris Willis, Director of Security Solutions at Sayers, recently spoke with Danelle Au from Palo Alto Networks about advancements in the next-generation firewall space. Discussion of new developments in converged infrastructure. Chris Roben is HP's Director of Interoperability Labs - Americas, and he is an expert on data center convergence. Hear how you can prepare for changes affecting your infrastructure. Bill Tohtz, Chief Architect at Sayers, and Chris Roben, Director of Interoperability Labs - Americas at HP, discuss converged infrastructure and it's impact for organizations. VMware and Sayers present best practices on end-user computing.